The bill, above all, has been giving me pause............ I'd like to see the beginnings of a little hook at the end of the upper mandible. So does the color. Eastern Kingbirds are very dark. (black), even as feathered nestlings. This bird in not black. I believe that an Eastern Kingbird would be black at this stage. The bird is not much more than a week from fledging. The lack of any white tips on the tail kind of rule it out for me. One more thing that bugs me...the gape on David's bird does not extend back to the eye. 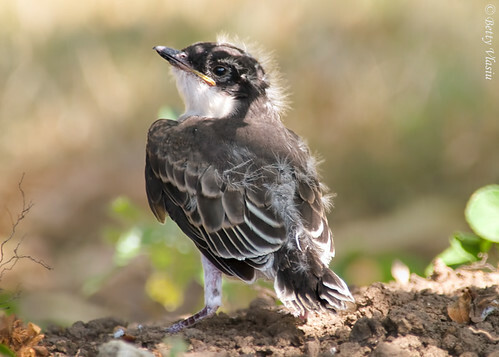 The attached picture of an Eastern Kingbird shows a nestling of similar age the clearly exhibits the white tipping. I just don't think it's an Eastern Kingbird though. First of all: you are waaaay better than I am at finding good photos of nestlings and fledglings. These are great pictures, BK. I agree about the size. Three inches is way too big for a gnatcatcher, but not quite big enough for a kingbird. I figured the age was just a best guess, so I was willing to roll with it. But the lack of white edging on the wings and tail retrices DID bother me. I think the tail may be the death knell for a kingbird ID. I'd taken a close look at it and noted that the tail feathers in David's bird were extremely abraded, but it's pretty hard to rationalize ALL the white edging disappearing from the tail AND the wings through heavy wear. The relative blackness of the feathers doesn't actually bother me. I've held Eastern Kingbirds in my hand and their wings and some of their tail feathers are surprisingly "fuscous" as they say. Not black, at all, but brownish/olive when viewed close up. But the absence of the previously mentioned white edging is not so easy to discount. And the coloring of David's bird almost perfectly matches what one would expect from an Eastern Phoebe. Eastern Phoebe seems like the best guess at this point. Still a flycatcher, and well within the expected breeding range in Helotes, though I'd like David to tell us there's water nearby. The gape also matches. It's one of the reasons that, on my very first viewing, I thought the bird looked like a flycatcher, specifically an empid. But no empids would nest near David. However, look closely at the gape and note that not only does it not extend as far as expected for a kingbird, it also curves downward as in an empid AND as in a phoebe. While even a phoebe would have a tiny hook on the end of the upper mandible, as I said earlier, David's photo features a light flare that obscures the tip of the bill, so we can't know exactly what his bird's tip looks like. The stumbling block for me, the reason I almost immediately rejected phoebes, is because of the extraordinary bright whiteness of the throat, breast, and belly of David's bird It just does NOT say phoebe to me. I've held both adult and juvenile Eastern Phoebes in my hand and I don't remember them ever being this white. Maybe it's an artifact of David's photo? I dunno. 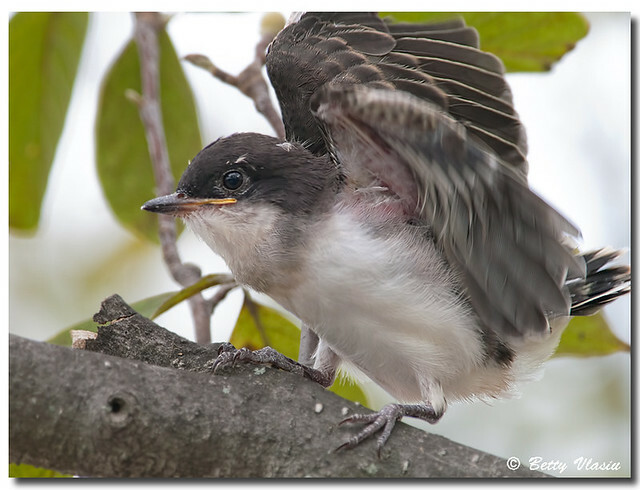 Maybe you can find good pictures of Eastern Phoebe nestlings or fledglings that will show their undersides more clearly. Perhaps they're not as drab when juveniles, and the darker breast shading develops later. On the plus side, David's photo shows what looks like the very beginnings of a faint and very drab yellow shading on the flanks near the tarsi, which is what one would expect in a juvenile Eastern Phoebe. So, at this point, perhaps the best, but still speculative, guess is Eastern Phoebe, the oddly intense white undersides notwithstanding. Well done, BK. Post it in the Birds of Texas group on Facebook. Someone there will know. Will this help any? Sorry, but this is the only other angle I've got. And yes, I'm about 2 miles from the edge of the eastern border of Government canyon, as the, er, Kingbird flies. Why, of course, that is a baby bird! And cheat on my BBC peeps? I couldn't even entertain the idea! Haha! That does help. The buffy wash on that bird's flanks makes it look even more like a young Eastern Phoebe, though I wish it was more lemony. But I agree with Jason, post your photos on Birds of Texas and let crowdsourcing solve our problem. I can't take much more of this mystery. Yes that really helps. I would say with a high degree of confidence - Eastern Phoebe. Is that little guy blind in the right eye or is that just an artifact of the second picture? Is that little guy blind in the right eye or is that just and artifact of the second picture? Whelp. I think my lovable family canine actually get herself a taste before we rescued him from a blood thirsty Italian Greyhound mix. Last word of advice, David: if your bird is indeed an Eastern Phoebe nestling that left the nest too early for whatever reason, that nest shouldn't be too hard to find. Eastern Phoebes almost always build their mud-and-vegetation nests on human structures. Look on house eaves, ceilings, in culverts, etc. and you'll probably find a nest stuck to a man-made surface somewhere nearby. The nests are fairly robust and It's not unusual for them to be reused over the course of several years. Eastern Phoebes are also active flycatchers, so you may see the adults zooming around low on your property, especially near water, catching small flying insects, and then bobbing their tales while waiting on perches. What Bird: http://www.whatbird.com/ The iBird app is affiliated with the site somehow or another. Unfortunately the forum is down (being moved) and that means the bird id forum is down. Bummer... those folks are no better than HMoD and BK but there's a lot more of them. Sure, but have you considered Facebook? BNA (Birds of North America) is awesome, especially now that it's user-friendly and filled-out. It needs all the supporters it can get. Good for you, iCe. When was the last time you cleared your browser cache?